Puerto de Mogan a picturesque harbor town is designed by the artist Ralph Neville, is located in the most western part of the south of Gran Canaria. 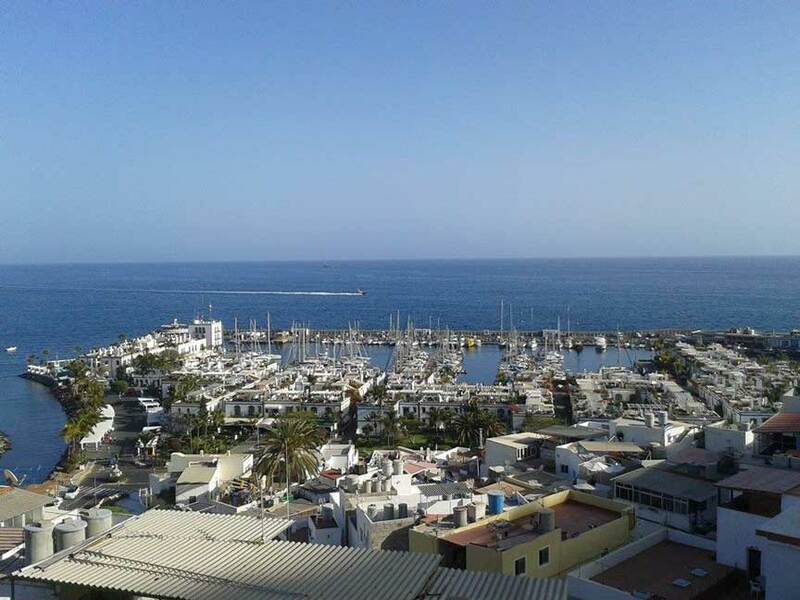 Puerto de Mogan (map) is actually the beach and the marina of the municipality of Mogán and about 180 years old. This seaside resort is located directly on the Atlantic Ocean and surrounded by mountains. Therefore be the tourist fishing village in a valley. The port of Mogan was formerly the only way for that time residents to come into contact with the other inhabitants of Gran Canaria. The first settlers came mostly from Fuerteventura and Valencia in Spain to settle here for the fishing. On the territory of Puerto Rico there is on a steep rock an archeological site “Casa de las Sietes Esquinas“. Literally translated “The house with the seven corners”. Climatically is Puerto de Mogan well located. It can even count on more hours of sunshine than say, Maspalomas or Playa del Ingles. It receives 850 000 tourists annually. Because of the many canels which are make a way between the houses become Puerto de Mogan in the vernacular “The Venice of Gran Canaria“. 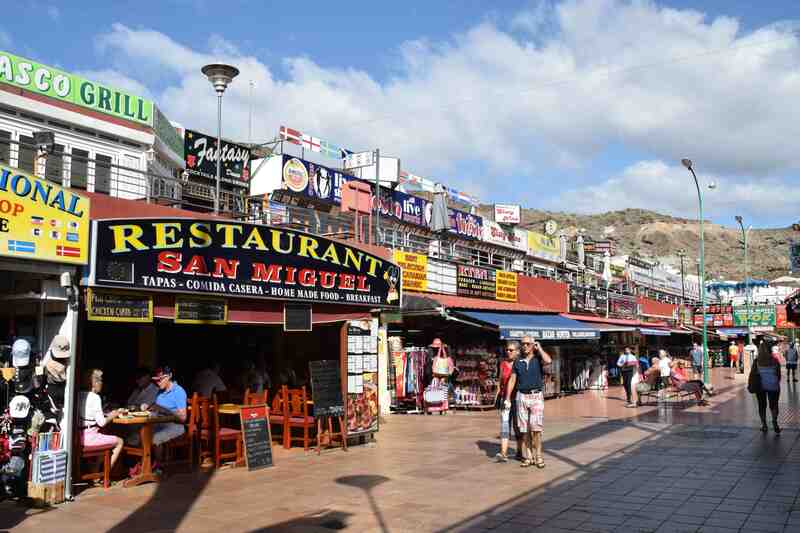 The last few years has Puerto de Mogan having undergone a metamorphosis. The natural beach of yesteryear has given way to a part of an artificial beach that is supplied with sand from the Sahara. The beach is ideal for family holidays with children. When you reach the port town is the first thing that strikes the old white port building. The port of Puerto de Mogan is very popular among sailors. Lack of space for your boat or yacht is certainly did not with more than 200 berths. In the harbor is also a dry dock where you have the opportunity to maintain the boat. But this little harbor is not only for sailing, it is also a fishing port. Fishing is still today an important source of income for Puerto de Mogán. Daily you can admire in the small fish market the sorting , cleaning and selling of the fishing . If you are lucky you can sometimes find between the fishing tunas with a huge of almost a meter. The fresh fish you can obviously tasting in the present fish restaurants at the marina. The restaurants like to let you taste their local specialties such as grilled tuna and tasty fish soup (caldos de pescado). Local fishermen are proud of their profession and certainly appreciate a visit to their craft. The white houses of Puerto Rico are the hallmark of this small town. They are richly decorated with colorful flowers like Hibiscus, Bouganvilla, Tumbergia and the most famous flower of the Canary Islands, the Esterlizia. A walk through the picturesque streets will take you to souvenir shops, a candle shop, restaurants and bars with terrace. Here you can really speak of the “little cafe on the harbor“, several years ago a big hit in the Netherlands and Belgium. You can visit the small church of the patron saint San Fernando and Virgen del Carmen between the new hotels and shops. For the believers, there is on Thursdays and Saturdays a mass at 18:00. The beautiful church is located on the Paseo de los Pescadores. Here and there you see houses that are actually built over the canals. The oldest part of Puerto de Mogan is located on the steep rocky slope that starts at the car park on the Callejón Explanada del Castillete. Here you see traditional houses from the time that Puerto de Mogan is formed. I can recommend you a climb up to the platform at the top through the narrow streets between the houses. 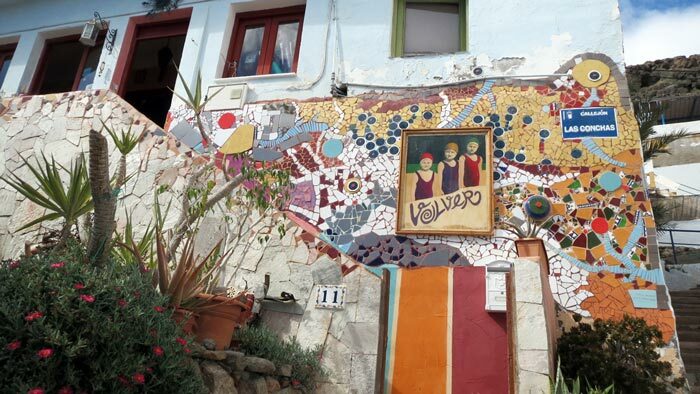 In the Callejón las Conchas you will discover a beautiful example of a house façade finished in mosaic. From the platform, you have a breathtaking view of the harbor town. It is especially at sunset lovely to stay here. Because of its charm is Puerto de Mogan a true paradise for romantic souls. For the ladies among you there is the weekly market every Friday. On the cozy market they sell artisanal products and includes typical Canarian products, souvenirs, clothing, fruits and vegetables and much more. The market takes place from 08:00 to 14:00. For art lovers, there is a market every Monday in the square to the parking lot. This market starts at 09:00 until 14:30. Shopping in the old city center can in the many shops. Artisanal products such as handmade candles, swimwear, clothing made of cotton, pearls, etc … Do you have a lot of interest in pearls of the Canary Islands there is even a regular workshop where you can learn how to make a necklace of pearls . Perhaps you are a sporty person who has a love for nature underwater. As deep sea diver you will surely be rewarded here. The magnificence of the sea underwater invites to underwater photography. Do you still not diving or snorkeling, then there especially for tourists a yellow submarine whereby you can make a trip underwater. Would you still try diving then there is a local diving school. For fishing enthusiasts is Mogan a must. In July organizes Mogan a competition fishing on Blue Marlin . What regard accommodation such as hotels and apartments you can count on a wide range of wonderful hotels. Not so far from the hotels, there is a Water Park Lago Oasis. The water park is open every day from 10:00 to 18:00. It is just next to Puerto de Mogan in Taurito. If you stay at the hotel Paradise Lago Taurito you even have free access to Lago Oasis. 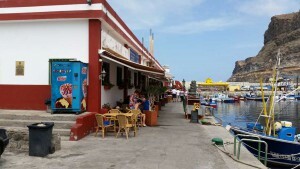 Puerto de Mogan is very well located for further trips. From the picturesque fishing port you can by boat back and forth to Puerto Rico. By boat, you have magnificent views of the rocks and cliffs along the shoreline. The first tourist area from Puerto Mogan what you see is Taurito. After Taurito there is the small but cozy Playa del Cura, Playa de La Verga. Playa de Amadores is your next viewpoint to end up in Puerto Rico. Continue towards Maspalomas lying the hotels, apartments and the small beach of Patalavaca. The beach is only 290 meters long. There is a pedestrian promenade that Patalavaca connects with Arguineguin. An excursion that I can recommend to you, at least if you like partying and enjoying the sea is a trip on a sailing ship, the Afrikat. Sea excursions searching for dolphins and whales are in abundance. I have to imparting you that you have been lucky to have this beloved fish spotting. There are also fantastic guided excursions in Gran Canaria, you can find this under guided tours to Puerto de Mogan. More info in the port of Puerto de Mogan, Puerto Rico and Arguineguin. Puerto de Mogan can reach you today by car via the motorway GC-1 or via the coastal road C-500 and C-812 which is actually the same way. The view is beautiful here with frequent a stunning view of the Atlantic Ocean. A good alternative is of course by taxi. Parking in Puerto de Mogan is a charge per hour. By public transport society Global from Playa del Ingles and Maspalomas, take bus No. 32 or on Saturday and holidays then bus No. 33 to Playa del Ingles – Puerto Rico – Puerto Mogan. Coming from Las Palmas then take bus No. 1. For a short visit to the village of Mogan, take bus No. 84. In total has Global six several bus routes to and from Puerto de Mogan. The bus station is located in Avenida de Las Artes.